Carrie Miller, a 1996 graduate of Concordia University Wisconsin, currently serves as the principal of Mt. Calvary Lutheran School. Mt. Calvary is an urban Milwaukee school of 200 students that strives to prepare its students, primarily low-income and African-American, for high school. Throughout Miller’s years at Mt. Calvary, the students have consistently received “strong” test scores and continue to do very well academically. This is something Miller has actually made part of her personal mission, as she says, “some people expect our students not to be successful, but I’m determined for this not to be the case.” At the same time Mt. Calvary’s staff works to meet students’ academic needs, they place an emphasis on sharing Jesus with children. Mt. Calvary provides a strong faith background and has a definite Christian identity. Miller’s path to Mt. Calvary and Lutheran education started early in life. Miller’s mother is a teacher, and she stated, “I always knew I was going to be a teacher.” When looking at colleges, she only considered going to a Concordia college. She knew she wanted to continue in her Lutheran education and Concordia University Wisconsin was a good fit. While at Concordia she studied Elementary Education with a minor in Psychology. Miller found her days were always busy. She lived on campus (Wartburg) and had the same roommates for several years. Miller says, “I remember the people, and the relationships I formed.” Although she had a job off campus, she still found time to be active on campus in different groups especially, Concordia’s youth ministry team. When graduating from Concordia, Miller knew she was led to urban ministry and she accepted a Call to teach fourth grade at Mt. Calvary Lutheran School. Miller has served at Mt. Calvary for the past 20 years, which she cites as a perfect fit for her passion for urban ministry. She served as teacher and youth director for six years before there was an opening in administration, where “God saw fit” that she become principal. The administrative position has really given her the chance to “share the Gospel with kids, who, then carry it home to their families,” she said. The idea of family itself is also important to what she strives for at Mt. 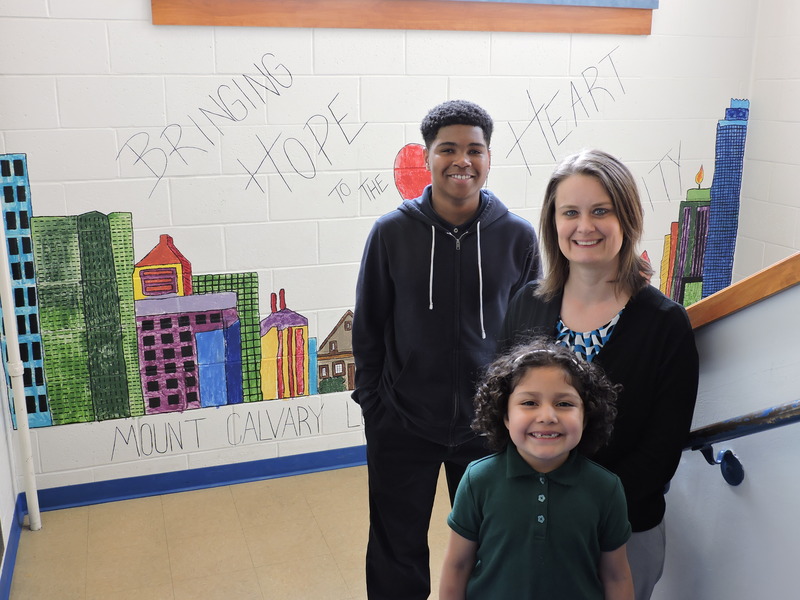 Calvary; Miller believes having a family emphasis within the school gives families an opportunity to be included and invested in their children’s education. While Miller “works hard in the office,” she also “plays hard” and finds opportunities for traveling and many outdoor activities including camping, hiking, swimming, and biking. In addition, Miller enjoys being able to participate in service projects both locally and internationally, including Bethesda’s Camp Matz and Proyecto Genesis, an after school program in Guatemala. Professionally, she has completed a Master’s degree in community counseling. She has been part of the LCMS School Leadership Education Development (SLED) program, completing the training herself, as well as having served as a mentor to current or hopeful school administrators. Miller has been recognized by Wheatridge Ministries for “Excellence in Urban Education” and just recently has been chosen as Concordia University’s Alumna of the Year. She said she is “humbled and appreciative” of the recognition and believes that it reflects Mt. Calvary as a whole as well as the entire team who makes her work possible. Beyond being recognized as “Alumna of the Year” Miller has made an effort to stay connected with Concordia. She frequently consults with Concordia’s Education department and has varied contact with Concordia students, ranging from speaking in classes to conducting mock interviews with students, all with the goal of “encouraging Lutheran Ed students, specifically in considering urban ministry.” Mt. Calvary will frequently host CUW students for clinical hours and student teaching, and Miller definitely encourages students to come visit Mt. Calvary. Concordia University first recognized a distinguished alumnus or alumna in 1961. Carrie Miller is the 57th person to be so recognized. This award is to give recognition to an alumnus/alumna who has consistently demonstrated faithful stewardship of his/her talents and has rendered notable service to the church and to the University. CUW faculty and the alumni office nominate individuals for this award and the honoree is selected by the faculty and the President’s office. —This story was written by CUW alumnus Josiah Buss (’15). The Future is Now: Concordia Students and IPE in the (local) News!